Last night I watched the sink down drill on your website repeatedly before leaving work, then I went home and watched your Swim Smooth DVD segment on breathing several times. Today I started my workout with the sink down drill and then several slow laps with breathe-bubble-bubble-breathe. I forced myself to breath bilaterally and to constantly exhale in the water. I instantly noticed that I didn’t feel nearly as winded after the warm up as I usually do. I told myself to focus ONLY on breathing today and to let everything just take its course (sometimes I get wrapped up in over thinking my stroke – which, in its own way, is a form of under thinking). Today’s workout was challenging: we had several pull sets of increasing yardage with fast sets of 100 swim between them. All I can say is, WOW! This morning, I had my best day in the water yet. I kept repeating "breathe-bubble-bubble-breathe" to myself throughout the swim (with only a couple of mental lapses) and on the longest of the pull sets (600 yards), I finished way ahead of where I would normally be versus my lane mates. A woman who swims in the lane beside me commented on my "blistering pace" this morning (a relative term, I know). What amazed me was just how relaxed I was the entire time and my right shoulder didn’t hurt at all during the swim! Frankly, I hardly felt winded when the 600 pull was over. (The only time I struggled this morning was during a couple of fast 100s when my mind drifted a little and I started holding my breath again, which caused me to breathe to my default side.) When the workout was over, my first thought was, "that’s it?" When I got out of the water, I was not nearly as wiped out as I usually am after a swim. Today was a HUGE psychological breakthrough for me (I was nervous on the way to the pool this morning about trying a new breathing exercise). I no longer feel like I am stuck and I got a glimpse of what relaxed swimming feels like. I feel that mastering my breathing first is the KEY that will allow me to patiently focus on other elements of my stroke that also need improvement. I will be diligent and persistent in working on my breathing as I can no doubt get better. Paul, thanks for your interest, your thoughts, and for your inspiration! Today was a big step forward in my swimming and I feel like shouting it to the world, but since most won’t understand, I thought I’d at least drop you a note to express my excitement and sincere gratitude. Sometimes the most simple things make the biggest difference to your swimming. If you find breathing a challenge, feel puffed, head-achey or just tense when you swim then it's essential for you to develop your exhalation technique if you want to improve your swimming. For everyone else it's merely very important to do so! Note 1: You can find the sink down exercise John's referring to at the bottom of this page: Breathing Exhalation. Exhaling into the water doesn't feel very natural at first and the sink-down exercise helps you get the feel of it. Note 2: Bubble-Bubble-Breathe is a mantra to say to yourself whilst swimming. It helps co-ordinate breathing every three strokes (bilateral breathing) and exhalation into the water. When you breathe every three strokes the pattern is normal-stroke, normal-stroke, breathing stroke and repeat. Very important: Swim each of the repetitions at the same speed - the maximum sustainable pace you can manage over the whole swim. Don't sprint the 100m then slow down over the 200m and 300m. So the 100m should feel straightforward, and 200m quite hard and the 300m very hard to sustain. Great distance swimming is about pace judgement under pressure and this starts in training! You can see why we've nickname this the Goldilocks set as the 100-200-300s get progressively harder - think 'baby bear' 'mama bear' 'papa bear'! This is the main set of your swim session, you should perform a warm-up and ideally a short drill set before starting this. Also follow with a cool-down swim to help flush waste products from your muscle groups. If you swim in a yard pool simply swim the meter distances as yards. If you like you can improvise the session to lengthen it a little. If you have a Wetronome Mk2, swim this set using the lap-interval mode to beep every 25m and take one beep rest (arrive on one beep, go on the next) between each swim and two beeps rest after each set of 100-200-300. If you have a good understanding of your CSS pace then swim the set at this pace or just a touch faster. The Goldilocks set is an example of 'CSS' swim training - what we consider to be the best way to develop your lactate threshold pace. This sort of controlled sustained speed with short recoveries is the key to becoming a faster distance swimmer. Many swimmers attack shorter swims with more recovery - great training for sprinters but no so good for distance swimmers. Find out more here. You'll find our complete training knowledge, including a mix of key sets like this one, in our 35 Session Waterproof Training Plans. A good torpedo push-off helps develop your full stroke technique. That's why every swimmer and triathlete should perform them well, whether they are a beginner, intermediate or advanced level swimmer. - Place one hand aligned on top of the other. Tuck the top hand's thumb over to hold it to the bottom hand. - With your hands in this position, reach tall and straight above your head. Ideally you should be able to get your arms behind your head in this position - this is straighter in the water and creates less drag if you are flexible enough to do so. - Next squeeze your shoulder blades together to pull your arms in tight - as narrow as possible. This is the tuck that elite swimmers use - it's extremely fast. You will feel the stretch through the arms and shoulders but also through your core. You have to stretch your core to become straight and tall in this position and that's great practice because you should look to do that in your full stroke too. This tightly tucked position is extremely low drag and you will travel very quickly off the wall with a good strong push from the legs. Aim to travel about 50-60cm (2 ft) beneath the surface of the water, surfacing just as you take your first stroke. If you do this right you should take your first stroke at least five meters down the lap. If your pool has turn flags, these are 5m from the ends so use them as a guide. Remember: first stroke after the flags! 1) The tall stretch reminds you that this is how you should swim - tall and straight in the water. It's a little re-focus at the beginning of every lap. 2) You are traveling very fast off the wall in this position (possibly twice your normal swimming speed) and the flow and feel of the water round your body gives you insight into what swimming at a higher level feels like. 3) When you start your first few strokes you will be moving faster than normal. This is valuable experimental time for you - try and maintain that speed as long as possible with your stroke technique. 4) A good torpedo tuck develops and maintains your upper body flexibility. You will push off between 40 and 100 times every session and each of those is a small stretch to your chest and shoulders. Over time this can make a huge difference to your range of motion and so allow you to have a better stroke technique. 5) If you are lazy with your push-off with arms and legs everywhere, you'll probably swim that way in your full stroke too. Good stroke technique starts at the push off. 6) Last but not least, a good torpedo push off is fast, meaning you'll swim quicker in the pool. That might be just what you need to join the next lane up in your squad or drop your training partners at will! One last tip for those of you who push-turn. 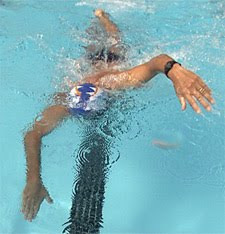 After you perform your last stroke, stay on your side into the wall, don't reach the wall with you torso flat. Then use the hand that reaches the wall to push back over your head through the air dynamically, this shove flips you over, rotating your legs underneath you into their pushing position on the wall. This is a lot faster than coming in flat and having to rotate horizontally. We call this a 'submarine turn' - very slow and not pretty to watch!